Accuracy of measurement: value of increasing, 23: limit without lenses, 25; limit with lenses, 27; increase due to lenses, 30; increase due to interferometer, 36; of standards of length with grating, 85; of length of seconds pendulum, 86; of earth’s circumference, 87 ; of wave length with the interferometer, 98. Air wedge: interference produced by, 15. Amphipleuka pellucida : use as test of resolution, 30. Analysis ; of periodic curves, 68; of the nature of a source of light, 76. Arago : velocity of light, 48; interferometer, 51. Black spot : on soap film, 53; thickness of, 54. Boiling of star images, 129. Cadmium: analysis of radiations of, 81; red radiation as standard of length, 91; number of waves in meter, 98; action of magnetism on radiations of, 116. Comets : resistance by ether to motion of, 45. 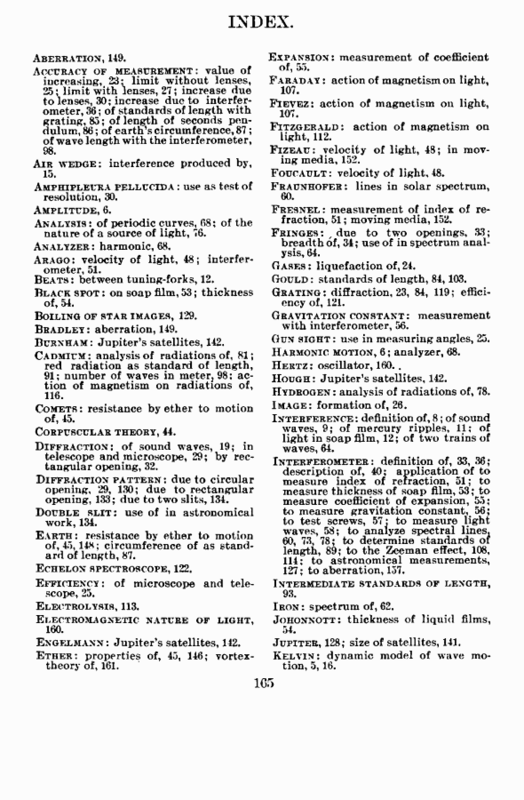 Diffraction; of sound waves, 19; in telescope and microscope, 29; by rectangular opening, 32. Diffraction pattern: due to circular opening, 29, 130; due to rectangular opening, 133; due to two slits, 134. Double slit; use of in astronomical work, 134. Earth: resistance by ether to motion of, 45,148; circumference of as standard of length, 87. Efficiency: of microscope and telescope, 25. Electromagnetic nature of light, 160. Ether: properties of, 45, 146; vortex-theory of, 161. Expansion: measurement of coefficient of, 5o. Faraday: action of magnetism on light, 107. Fievez: action of magnetism on light, 107. Fitzgerald: action of magnetism on light, 112. Fizeau: velocity of light, 48; in moving media, 152. Foucault : velocity of light, 48. Fraunhofer: lines in solar spectrum, 60. Fresnel : measurement of index of refraction, 51; moving media, 152. Fringes: , due to two openings, 33; breadth of, 34; use of in spectrum analysis, 64. Gases : liquefaction of, 24. Gould : standards of length, 84, 103. Grating : diffraction, 23, 84, 119; efficiency of, 121. Gravitation constant: measurement with interferometer, 56. Gun sight : use in measuring angles, 25. Harmonic motion, 6; analyzer, 68. Hydrogen : analysis of radiations of, 78. Interference: definition of, 8; of sound waves, 9; of mercury ripples, 11; of light in soap film, 12; of two trains of waves, 64. Interferometer: definition of, 33, 36; description of, 40; application of to measure index of refraction, 51; to measure thickness of soap film, 53; to measure coefficient of expansion, 55; to measure gravitation constant, 56; to test screws, 57; to measure light waves, 58; to analyze spectral lines, 60, 73, 78; to determine standards of length, 89; to the Zeeman effect, 108, 114; to astronomical measurements, 127; to aberration, 157. Intermediate standards of length, 93. Johonnott: thickness of liquid films, ->4. Jupiter, 128; size of satellites, 141. Kelvin : dynamic model of wave motion, 5,16.